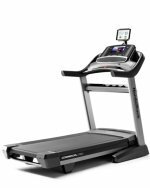 The Fitnex TF55 folding treadmill is a powerful runner’s machine with a big 3.0 CHP motor, a 15% incline, and heart rate control monitoring. The console has a profile matrix and 3-window LED display for readouts plus a scrolling message center. Programs include manual, walking courses (3), running (3), cardio (3), fat burn (3), endurance (3), interval (3), heart rate control, and custom learn. The Fitnex TF55 folding treadmill has a number of commercial grade features to note, such as the 3.0 CHP DC motor, an elevation motor that delivers 700 lbs of thrust, a 20" x 54" running surface, a 2-Ply belt, and a 1" Texaglide lubricated deck. The shock absorption system features 8-Point Elastomer cushioning to lessen the jarring impact on the legs and hips when you run or walk. It is built with quality components, and the pairing of the shorter 54" belt with a strong motor is a definite advantage. There are other nice features on this model such as the one-touch button speed control, contact and telemetry heart rate monitoring, the 15-degree incline to increase the workout intensity on the lower body muscles groups, moving handlebars for upper body toning, and 22 preset workouts that help you focus on your fitness goals. 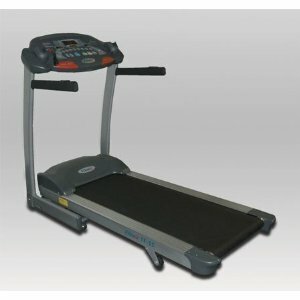 The reviews on the Fitnex TF55 folding treadmill have been very favorable and we feel it is the best value of the three Fitnex machines. However, since it doesn’t offer perks such as an iPod/mp3 dock, speakers, fan, or a free chest strap, it leaves us wanting more. At $1,795, it is $500 more than comparable folding models that have a 60" long belt, 3.0 CHP motor, 2-year labor warranty and a lot of goodies on the console. We recommend you read reviews on the Livestrong LS13.0 and the Yowza Biscayne, as well as a couple of Smooth and Sole models in the $1300-$1800 range.